Matching colors that already exist in your home is a task done by everyone. 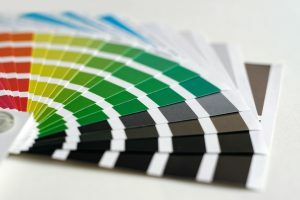 If you want your local paint store experts to do it for you, you need to carry with your samples to match and allow them time to work on matching the colors. Alternatively, if you want to DIY, you need excellent lighting, soap, water, and some level of patience. For you to match existing colors, there are some facts you need to know. The hue or color of an object is generated by light illuminated on the object in question. Sunlight creates all wavelengths and color possibilities that can be seen by the naked eye, something you would not achieve with standard light bulbs. Due to this, an object observed in natural sunlight looks very different when viewed under artificial light like living room lamps and paint store fluorescent lamps. A good example of such scenarios is when driving into a parking lot with harsh sodium vapor lamps; you will notice your car appears to be of a different color. The gloss or sheen of paint additionally makes it tough to match color stains. It is much simpler to match dull, flat colors than matching those with gloss. With high gloss paints, it is nearly impossible to touch up an error using a similar high gloss paint only a few days after a new paint job. To match walls in your living room, you first rinse them with soap and water. The step is compulsory even if you want to repaint the whole room. Always apply paint on a clean surface that is dry. Washing removes accumulated grease, dirt, and smoke particles. Additionally, it is practically impossible to attain an exact match on a dirty wall space. Select the preferred paint, some disposable cups as well as measuring spoons and begin blending paints until you come up with your custom formula. After the walls are spotless, head on to your local paint dealer store and ask for various color chip samples that closely match the color of your wall. Head back home and hold these samples against the clan wall at different angles on a sunny day. Try to choose a color on a wall not exposed to direct sunlight. Desist from holding a chip on a sunbeam-illuminated wall. One of the color chips will most definitely match your wall color. Head back to the paint store and buy a quart of flat paint for custom tinting to the color chip you feel is the closest match to your wall. For additional luck in matching colors, try to select a color slightly darker than the color you intend to match. Buy an extra quart of white paint. You need the plain white paint to adjust colors back at home. Apply a little pre-mixed amount of paint to your wall. It would appear to be a perfect match when you apply it at first. 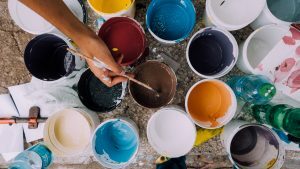 However, many flat paint colors become deeper as they dry with the fact that wet, glossy nature of paint and the fact that color pigments concentrate as paint dries cause this happening. In any case, it is all right if the paint dries becoming darker. You will now begin making micro-batches of paint using your paper cup and plastic measuring spoons. Take one teaspoon of colored paint and one teaspoon of pure white paint and mix in a paper cup. Always clean and dry the measuring spoon well before scooping paint from a different container. Apply this to the wall and give it time to dry, roughly 20 minutes. Alternatively, you can speed up this process by using a hair blow dryer. Change the quantities of white paint and colored paint in case you do not get a perfect match. Take note of the test paint surfaces and the amount of paint that you dilute with one another. With lots of patience and some luck, you will probably get a perfect match. Seamlessly match your paint color with the highlighted techniques and you will not have to incur extra costs for an extended period. The difference between a room that appears to be dull and boring is only a step away. By painting your room with fresh paint, you are transforming that room instantly. However, there are numerous challenges experienced by homeowners who are looking to completely change their rooms. You should make a decision. Do you want to hire a professional painter to paint and change your room or take the initiative to do it yourself? Interior painting on its own cost between $12 and $50 per gallon, of course depending on the quality of paint you choose. To paint all walls and ceiling of a twelve, square foot room, you require an average amount of between $25 and $100, with additional costs for brushes, drop clothes, primer, rollers and other supplies. Therefore, expect to pay an average of between $200 and $400 for this room. That is if you are using the best quality paint brands with the help of a certified painter. A larger room would cost you $300-$700. Painting the ceiling would additionally bounce up the costs you incur. One thing you should always remember is to use paints of the best quality. Whether you hire a professional painter or doing it yourself, the best paints are most preferred as you will not have to incur extra costs associated with repeated paintings from time to time. Before you begin any painting job, make appropriate preparations. If you opt for a DIY style, ensure you research appropriately and familiarize yourself with the Do’s and Don’ts of painting. 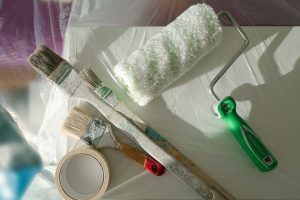 If you choose to go for DIY way, visiting websites such as ThisOldHouse.com will give you step by step guides and necessary tips for painting your room. You will find it best to pay for any extra cents that would enable you to get your hands on the best paint brushes and rollers. Aim at avoiding any cheap products as they would leave unnecessary marks and fuzz on walls. During any paint job, furniture has to be moved from one point to the other. The removal of such is always not included in the painter’s estimates. If you cannot do this yourself, it would be most appropriate to ask whether there are any extra costs to be expected for this. Additional painting techniques involved when it comes to detailed objects such as baseboards, molding and wainscoting would add on to the contractor’s price estimates. These additional charges vary from one contractor to the other depending on the complexity and technicalities involved. If a painter is only set to paint one room in a home, you are likely to be charged much less for any extra rooms as compared to the first. You are therefore better off painting all rooms at the same time to save money. Painters have been known to quote much lower rates in winter, and early spring as these periods normally have less work available. As you look for a contractor between these periods, feel free to inquire whether they would offer you any discounts. Critically examine the contractors you hire and consider numerous estimates. Keep in mind that the best services come from companies and contractors who are certified by the relevant agencies. 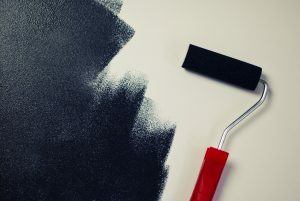 If you are uncertain of the amount of paint you require, consult or visit Easy2DIY.com and calculate the average paint gallons you need. Ask for recommendations from expert painters for the best color combinations to use for your room. As children grow up, their perceptions about their favorite colors change more often. The question, therefore, remains, how should a parent make a decision concerning their kid’s bedroom paint? A soft blue color tends to be the perfect color for such a room. 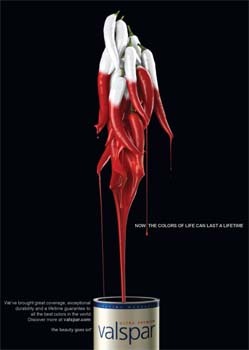 However, as the children grow up, they may consider the same colors they loved before to be very childish. In that case, one may opt to go for colors that would advance with your kid’s age. You may at one point or the other change one or two accessories just to eliminate monotony of the colors. Even though your children may not have appealing ideas as to the type of paint color they want in their room, try as much as possible to let them have a say in it. By so doing, they get a sense of belonging to the family as well as ownership of the room. Such an allowance guarantees you proper stewardship regarding looking after the room and keeping it clean. In some cases, the kids may choose bold colors that may vanquish the room, when this situation occurs you need to use the colors on items and furniture in the room such as on one wall, as a border, or as the backing to a bookshelf. Painting trim and ceilings are also not off-limits; these do not have to be white. Cool Gray has for many years been used in living rooms and kitchens since there was a perception that the gray color was dreary for child’s room but slowly the perception is fading away since a well-chosen gray sets out a perfect place for safekeeping of toys and artwork. One must not use the red color to paint every room in the house, however; it brings out a unique impression and fun in the kid’s room. You can use the color on accent walls in simulating fire engines to give a brighter look on reading nook or homework area. You can also compliment it with white or wood floors and furniture to give it a warm and inviting look. Most of the boys prefer blue color to other colors in their rooms but nowadays the blue color has grown popular for girls too. When it comes to using the color in kid’s room, you need to consider something darker such as cobalt or navy blue rather than pale or turquoise blue. These bold blue colors give a room a classic look and provide a striking contrast to bright tones. Never the less the walls will never show muddy fingerprints. Citron yellow is a dark lemon color similar to that of the fruit citron mixed with yellow paint. When using this color in kid’s bedroom in brings out a cheery impression in early shining mornings and one can pair with other warm colors and white to create a vibrant, energetic mood. This color gives the impression of both lime and leaf greens, which gives out a perfect combination and the painter, must ensure it does lead to a too neon shade of green, since it can be both soothing and upbeat which works well for any age or gender. One must look for a bright tone rather than a dark forest green, which can read as somber. Hot pink often portrays a pastel, sweet and classic version in a girls’ room. However, to achieve a long lasting power, try a fuchsia – a vivid pink with a tinge of blue you can also pair it with black, gray, or white for a hangout that is both super fun and sophisticated. Here are some great tips from expert house painting contractors for people who are fond of DIY projects. Follow these tips and success is guaranteed. Dry weather is the best time to do the project. When it’s humid, there will be drips and the paint will dry slowly. But in case there’s no choice but to paint on a humid day, do things slowly. Correct all errors before the next coat since the paint won’t dry fast. Just don’t overwork it. It will be obvious when the project is done. Do careful preparations and visual inspections. Is there cracking, peeling or flaking? Determine all the areas that need to be scraped or sanded before you apply a new primer and paint. Failure to do so will loosen the old paint. Greasy spots may require washing with soap and water. You can also wipe the walls using a damp cloth so that the paint will more likely stick to a dirt-free surface. Only purchase quality painter’s tape, roller covers and brushes. If you’re spending a great deal of money on paint, make it a point to splurge on the application as well. Any house painting contractor will tell you that quality brushes and rollers will give you excellent coverage. This means you don’t have to waste time on re-applications. A good painter’s tape will help you a lot to prevent blurs and drips. Determine the nap. Walls with more texture means a thicker nap you’ll require for your roller cover so that it can make it to cover crevices to have full coverage. But don’t go with overly thick because you might not like the result. When purchasing tools, give the shop staff information about your project so you can pick the best product. Cover everything that you don’t want to be painted and remove light switch and outlet covers. You will appreciate all the time spent covering furniture, floors and appliances and the little time spent on removing electricals before the actual painting project once you are done. Purchase drop cloths for this purpose. Small sandwich bags secured using tape is a great protection for doorknobs. A primer is ideal. If you are painting a smooth surface, it’s fine to use the paint-and-primer combinations. But if this isn’t the case, you would need to go with a separate primer as every house painting contractor recommends. A bonding primer should be used to cover surfaces that are challenging. Let the roller do its work. If you’ve selected a high-quality roller, then putting pressure on it when working won’t be necessary. A house painting contractor will tell you to use an extension pole to cover all areas with minimal effort without giving you a back strain. Start painting from top to bottom. After cutting the edges of your ceiling and baseboard with a brush, get your roller to paint from top to bottom. An amateur work will usually have spatters and drips by the time the paint job ends. A professional house painting contractor does it right by starting above and going downwards. Once a painted area is starting to dry, it is recommended to leave it alone because going over before it is dry completely might leave unwanted marks. Of course, you always have the option to call a professional house painting contractor. Just remember to let only licensed experts help you with your painting needs. For a quick, easy, and cheaper home upgrade, nothing can compare a fresh new coat of paint. By picking the right paint scheme, you can make tiny spaces look bigger, comfier, or more contemporary. Especially with old and outdated kitchen, paint gives a fresh new look on the worn-out space. Whether you are considering of starting a large-scale or small-brush projects, make use of paint to turn your outdated kitchen into a welcoming contemporary family space. One of the features differentiating old kitchens from new is their spaciousness. Even when the proportions are not that big, modern kitchen style centers on filling space with air and light. Pale colors such as white are excellent light reflectors and space enlargers. The lightest hues of beige, green or yellow may make any rooms appear even bigger than solid white because they convey the bleaching effects of bright light. Applied in monotone, as a finish for walls as well as cupboards, white and pale colors conceal visible outlines that may make a kitchen look confined. Contrasting color patterns define spaces more visibly than monotone ones, but they are also very effective at altering perceptions of space and shapes. Painting base cupboards, a dark color and overhead cupboards a light one, for instance, creates large and endless sweeps of color in a small kitchen. Selecting a color such as gray or even black can conceal the blocky outlines of under counter appliances such as the conventional oven. Using a dim red, green or blue on base cupboards makes pale colored overhead cupboards and walls seem visually lighter. Using a light color above counters and a dark one below can make the ceiling look higher, especially if cupboards and walls have a matching color. While there is a risk of bringing walls seemingly closer, a solid color on walls, cupboards or both can bring vibrancy to a gloomy kitchen. Keep bold colors in the food family to add warmth to the space: sage greens, butter-yellow, pumpkin orange, and varying shades of brown are particularly effective in larger kitchens. Contrast with off-whites on ceiling surfaces and cabinets. Add fullness to the look by including freestanding work islands or storage cabinets in the colored surfaces. For a cooler visual, muted blues and extensive grays give substance to cabinet or walls. 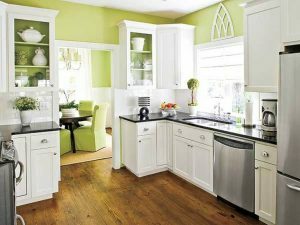 For small kitchens, large ranges of color can make the space look restricted, but this doesn’t mean everything must be monotonously white or pale color. If cabinets have glass doors, the inside can be a perfect place to use an accent color, as are the back walls of open shelves or alcoves. Choose several colors or several hues of the same color, to turn dull flat-front cupboard doors into a diverting and vibrant patchwork. Use primary colors or bold food-y colors such as eggplant purple, cherry red or orange as a single accent against a contemporary monotone. A dark wood and white pattern liven up by a persimmon-colored hanging light, a row of canary canisters, or royal-blue toaster signals renewed atmosphere for an old style and gives an old kitchen a new lease of life. Staining your deck is an excellent way of introducing a vibrant color to your outdoor space. Homeowners prefer to stain their own decks personally. That is because stains are more tolerant to foot traffic than paint. Nevertheless, painting your decks is not an involving task. Even though painting obscures the grain completely, you will be able to offer your deck surface unmatched personality. Some deck painting ideas include patterns like stripes, checkerboards, and faux rugs. If you have just created a new deck and deliberating on painting it, you have to apply premium quality primer to every side of the deck board before you begin the installation process. In as much as it is a bit of a hassle to apply primer to both sides of decking boards, it would go a long way toward fending off liquids from underneath your deck, thus keeping your deck boards stable. 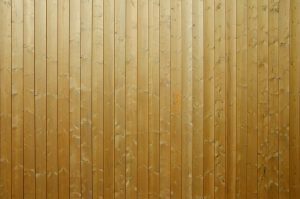 Otherwise, fluctuations in humidity and soil moisture could lead to expansion and contraction of the deck boards, stressing out the paint and making it peel and chip. Deck paints may be acrylic or oil-based, both of which are great products. Oil-based paints have the advantage of taking a longer time to dry, making it easier for outdoor applications with lesser possible errors. Acrylic paints additionally have fewer VOCs and are easy to clean. The other option is stains in solid color. They are similar to paints regarding performance and are designed to withstand heavy foot traffic. However, their colors are somewhat limited, and not as durable as paint. Deck paints are sold in different labels like porch paint or deck and concrete paint. Deck paint is formulated to tolerate constant foot traffic and other harsh elements. It is much thicker than the regular exterior paints and often includes mold and mildew inhibitors. Most products claim to offer a high level of slip-resistance. For proper painting and staining of your outdoor deck, follow this simple guide for the best possible results. Numerous products that are labeled as deck paint are made to restore your old deck surfaces. They seep through, fill small cracks, and hide stains or other minor flaws. For excellent adhesion, proper preparation including the complete removal of any old finish is crucial. The following guide aims at helping you come up with the best results and a long-lasting impression. Fix any protruding nails and screw heads. Fill any cracks that are larger than a quarter-inch wide using epoxy putty, and then stain the surface to match the surrounding deck planks. Use both stain and sealer remover on wood that had previously been finished with stain, paint, or clear sealer. Apply a deck wash product that would completely clean the entire wood surface, then it to dry for at least forty-eight hours. Sand any lifted grain or ridges with an 80-grit sandpaper, then clean up any remaining dust. Shield or cover any adjacent surfaces using painter’s tape or plastic sheeting to prevent the spread of stain to such area. Cover any nearby plants using plastic bags to prevent damage by paint or stain. 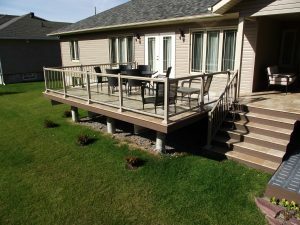 In as much as painting your deck is fun and engaging, it is ideal to seek the services and guidance of a professional who would take you through the entire process, minimizing any possible errors. When it rolls down to interior paint, finding the perfect color is the greatest challenge even though the good finish equally plays a role in the appearance of the room. Metallic interior paint conveys a shiny finish that adds a striking look to any surface in your home. However, applying it properly is key. You may pick from many different applications for metallic paint, therefore, consider the room and overall design style to identify the best option. With a shiny finish, metallic paint enables your walls to reflect light, making space appear bigger and brighter. Applying metallic interior paint in a small dark room as the all-over color is a great way of making it feel larger and brighter. Choose a lighter metallic shade like silver, gold, or taupe, to boost the effect. Nonetheless, if you plan on using metallic paint all over, every wall in your home must be in good shape, as the reflective finish would show every dent or scratch and imperfection on the surfaces. At times, painting the whole room with metallic paint may be too much; thus, the need for applying it as an accent. Choose one wall that you want to give emphasis to in your room, and stain with metallic paint. It may be around your fireplace or an art display area. For the bedroom, the wall surface behind your bed is a striking accent wall. A metallic finish will make the entire wall stand out. On the other hand, if you need a bold look, pick a shade that contrasts with the room. For a subtler look, choose a metallic paint shade that is from the same family as the color on the other walls. Whether you are finishing the whole room or a suitable accent wall, Metallic Paints can aid you to create a distinctive look, setting them apart from the rest! You do not need to cover the entire wall with metallic interior paint to make an impact on your surface. Instead, apply metallic paint as a border around the space for a metallic look. You may understate the design simply by painting metallic stripes along the top edges of the walls. However, you may need to add a border at the base and midpoints of the walls for more light in the room. Metallic paint may also highlight decorative trim and molding, bringing attention to architectural areas of interest. Because of a beautiful, reflective finishing, metallic interior paint packs an ornamental punch, using it sparingly offers an even greater impact. Consider the application of metallic paint as part of a design or pattern to make an accent wall, or give the whole room a faux-wallpaper effect. Instead of using custom interior paint with wall stencils, use metallic finishing over a dark wall color like black, navy or chocolate brown to develop an eye-catching pattern. For a more stunning look, apply a shade of metallic gold paint with a damask stencil pattern to come up with a gilded design that is sure to turn heads.